Electrocardiographic artifact due to an arteriovenous fistula. Teppei Okamoto, Shingo Hatakeyama, Hirotake Kodama, Hirotaka Horiuchi, Yuka Kubota, Koichi Kido, Masaki Momota, Shogo Hosogoe, Yoshimi Tanaka, Tooru Takashima, Fumitada Saitoh, Tadashi Suzuki and Chikara Ohyama. The relationship between poor nutritional status and progression of aortic calcification in patients on maintenance hemodialysis. Teppei Okamoto, Shingo Hatakeyama, Yoshimi Tanaka, Kengo Imanishi, Tooru Takashima, Fumitada Saitoh, Takuya Koie, Tadashi Suzuki, Chikara Ohyama. Butyrylcholinesterase level as an independent factor of erythropoiesis-stimulating agent resistance in patients on maintenance hemodialysis-a single-center cross-sectional study. Teppei Okamoto, Shingo Hatakeyama, Shogo Hosogoe, Yoshimi Tanaka, Kengo Imanishi,Tooru Takashima, Fumitada Saitoh, Tadashi Suzuki, Chikara Ohyama. Proton pump inhibitor as an independent factor of progression of abdominal aortic calcification in patients on maintenance hemodialysis. Teppei Okamoto, Chikako Tsutaya, Shingo Hatakeyama, Sakae Konishi, Kazutaka Okita, Yoshimi Tanaka, Kengo Imanishi, Tooru Takashima, Fumitada Saitoh, Tadashi Suzuki, Chikara Ohyama. Low serum butyrycholinesterase is independently related to low fetuin-A in patients on hemodialysis: a cross-sectional study. Ken Fukushi, Shingo Hatakeyama, Hayato Yamamoto, Yuki Tobisawa, Tohru Yoneyama, Osamu Soma, Teppei Matsumoto, Itsuto Hamano, Takuma Narita, Atsushi Imai, Takahiro Yoneyama, Yasuhiro Hashimoto, Takuya Koie, Yuriko Terayama, Tomihisa Funyu and Chikara Ohyama. Aortic calcification burdenpredicts deterioration of renal function after radical nephrectomy. Toshikazu Tanaka, Shingo Hatakeyama, Hayato Yamamoto, Takuma Narita, Itsuto Hamano, Teppei Matsumoto, Osamu Soma, Yuki Tobisawa, Tohru Yoneyama, Takahiro Yoneyama, Yasuhiro Hashimoto, Takuya Koie, Ippei Takahashi, Shigeyuki Nakaji, Yuriko Terayama, Tomihisa Funyu and Chikara Ohyama. Clinical relevance of aortic calcification in urolithiasis patients. Mihoko Sutoh Yoneyama, Yuki Tobisawa, Shingo Hatakeyama, Misaki Sato, Kiyoshi Tone, Yota Tatara, Ikuo Kakizaki, Tomihisa Funyu, Minoru Fukuda, Senji Hoshi, Chikara Ohyama and Shigeru Tsuboi. A mechanism for evasion of CTL immunity by altered O-glycosylation of HLA class Ⅰ.
MISAKI SATO, MIHOKO SUTOH YONEYAMA, SHINGO HATAKEYAMA, TOMIHISA FUNYU, TADASHI SUZUKI, CHIKARA OHYAMA and SHIGERU TSUBOI. The role of LIM and SH3 protein-1 in bladder cancer metastasis. Yoshimi Tanaka, Shingo Hatakeyama, Toshikazu Tanaka, Hayato Yamamoto, Takuma Narita, Itsuto Hamano, Teppei Matsumoto, Osamu Soma, Teppei Okamoto, Yuki Tobisawa, Tohru Yoneyama, Takahiro Yoneyama, Yasuhiro Hashimoto, Takuya Koie, Ippei Takahashi, Shigeyuki Nakaji, Yuriko Terayama, Tomihisa Funyu, Chikara Ohyama. The influence of serum uric acid on renal function in patients with calcium or uric acid stone: A population-based analysis. M. Oikawa, S. Hatakeyama, T. Narita, H. Yamamoto, S. Hosogoe, A. Imai, T. Yoneyama, Y. Hashimoto, T. Koie, T. Fujita, R. Murakami, H. Saitoh, T. Funyu, S. Narumi, and C. Ohyama. Safty and Effectiveness of Marginal Donor in Living Kidney. Transplantation Proceedings, 48, 701-705, 2016. Roles of Glycans in Immune Evasion from NK Immunity. Glycans Against NK Tumor Immunity. Glycosciense: Biology and Medicine, 1403-1409, 2015. Beta-1, 3-Galactosyl-O-Glycoprotein Beta-1, 6-N-Acetylglucosaminyltransferase1 (GCNT1) (C2GnT-L) and Beta-1, 3-Galactosyl-O-Glycoprotein Beta-1, 6-N-Acetylglucosaminyltransferase3 (GCNT4) (C2GnT-T). Handbook of Glycosyltranferases and Related Genes, P. 355-366, 2014. K. Imanishi, S. Hatakeyama, H. Yamamoto, A. Okamoto, A. Imai, T. Yoneyama, Y. Hashimoto, T. Koie, T. Fujita, R. Murakami, H. Saitoh, T. Funyu, S. Narumi, C. Ohyama. Post-transplant Renal Function and Cardiovascular Events are Closely Associated with the Aortic Calcification Index in Renal Transplant Recipients. Transplantation Proceedings, Vol. 46, P. 484-488, 2014. NORIKO TOKUI, MIHOKO SUTOH YONEYAMA, SHINGO HATAKEYAMA, HAYATO YAMAMOTO, TAKUYA KOIE, HISAO SAITOH, KANEMITSU YAMAYA, TOMIHISA FUNYU, TOSHIYA NAKAMURA, CHIKARA OHYAMA, and SHIGERU TSUBOI. Extravasation during bladder cancer metastasis requires cortactin-mediated invadopodia formation. MOLECULAR MEDICINE REPORTS, Vol. 9, P. 1142-1146, 2014. Invadopodia are essential in transurothelial invasion during the muscl invasion of bladder cancer cells. MOLECULAR MEDICINE REPORTS, Vol. 9, P. 2159-2165, 2014. Mihoko Sutoh Yoneyama, Shingo Hatakeyama, Tomonori Habuchi, Takamitsu Inoue, Toshiya Nakamura, Tomihisa Funyu, Gerhard Wiche, Chikara Ohyama, Shigeru Tsuboi. Vimentin intermediate filament and plectin provide a scaffold for invadopodia, facilitating cancer cell invasion and extravasation for metastasis. European Journal of Cell Biology, Vol. 93, P. 157-169, 2014. In Vivo Selection of High-Metastatic Subline of Bladder Cancer Cell and its Characterization. Oncology Research, Vol. 20, P. 289-295, 2013. The Scientific World Journal, Vol. 2013, P. 1-10, 2013. Trends in Glycoscience and Glycotechnology, Vol. 25, No. 143, P. 117-123, 2013. Core2 O-glycan-expression prostate cancer cells are resistant to NK cell immunity. MOLECULAR MEDICINE REPORTS, 7: 359-365, 2013. Osamu Soma, Shingo Hatakeyama, Hayato Yamamoto, Atsushi Imai, Takahiro Yoneyama, Yasuhiro Hashimoto, Takuya Koie, Shigeyuki Nakaji, Chikara Ohyama. Clinical implication of a simple quantitative frailty assessment tool for prognosis in patients with urological cancers. Hashimoto Y, Kubota Y, Yamamoto H, Yoneyama T, Hatakeyama S, Yoneyama T, Ohyama C.
MECA79 positive high endothelial venule (HEV) density correlates with clinical outcomes in Upper Tract Urothelial Carcinoma patients treated with Radical Nephroureterrectomy. An inconvenient truth: difference between patient-reported and doctor-reported outcomes in advanced urothekial carcinoma. A mechanism for evasion of CTL Immunity by altered O-glycosylation of HLA class I in bladder cancer. Mihoko Sutoh Yoneyama、Shingo Hatakeyama, Tomonori Habuchi, Takamitsu Inoue, Toshiya Nakamura, Tomihisa Funyu, Gerhard Wiche, Shigeru Tsuboi, Chikara Ohyama. Stabilization of invadopodia by plectin-mediated conjunction to vimentin intermediate filament is a critical molecular step of invasion and extravasation for metastasis in bladder cancer. Molecular weight of hyaluronan in prostate cancer specimens. Effect of heparin bridged transrectal prostate biopsy on the risk of hemorrhage in patients requiring temporary discontinuation of warfarin. Hamano I、Hatakeyama S, Narita T, Fukushi K, Yamamoto H, Soma O, Matsumoto T, Tobisawa Y, Yoneyama T, Imai A, Yoneyama T, Hashimoto Y, Koie T, Ohyama C.
An inconvenient truth: Difference between patient-reported and doctor-reported outcomes in advanced urothelial carcinoma. Hamano I、Hatakeyama S, Oikawa M, Narita T, Hagiwara K, Tanaka T, Noro D, Yuki T, Yamamoto H, Yoneyama T, Imai A, Yoneyama T, Hashimoto Y, Koie T, Ohyama C.
Survival benefit of neoadjuvant chemotherapy for muscle invasive bladder cancer in elderly patients. Matsumoto T、Hatakeyama S, Yoshikawa K, Fukui K, Yanagisawa T, Kawaguchi T, Imai A, Yoneyama T, Hashimoto Y, Koie T, Saito H, Yamaya K, Funyu T, Ohyama C.
A randomized, open-label, multicenter study evaluating efficacy of swich from dutasteride to tadalafil in benign prostatic hyperplasia patient with lower urinary tract symptoms (D-to-T trial). 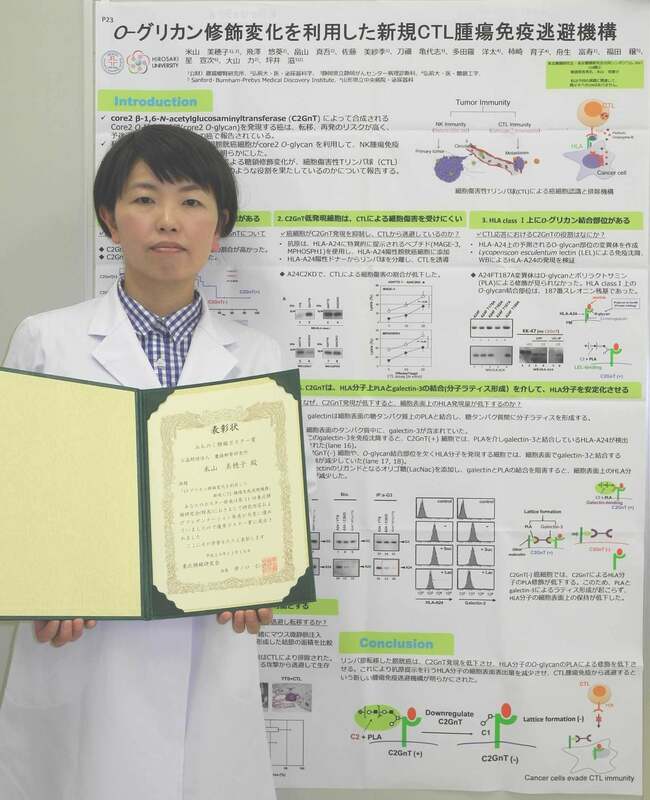 Yoneyama M. S.、Hatakeyama S, Funyu T, Tsuboi S, Ohyama C.
Bladder cancer-secreted extracellular vesicles destroy vascular endothelial barriers. Plectin anchoring invadopodia to vimentin intermediate filament is a critical molecular step for bladder Cancer cell invasion and extravasation for metastasis. Vimentin IF and plectin Provide a scaffold for invadopodia,facilitating cancer cell invasion and extravasation for metastasis. Serum N Glycan profile Correlates with diagnosis and progressin in Renal Cell carcinoma. AMGIOTENSIN RECEPTOR BLOCKER TREATMENT MIGHT AFFECT ESA RESPONSE THROUGH DISTURBING IRON HOMEOSTASIS IN HEMODIALYSIS PATIENTS.